The kantele is a Finnish version of an ancient zither-like instrument, known generically as the Baltic psaltery. Traditionally the instrument holds a strong symbolic significance as a part of Finland’s national culture, and it has been given the status of national instrument. However, according to present knowledge, there are many different ethnic groups in the Baltic, Black Sea and Volga area, West Siberia and Russia that play kantele related psaltery instruments, zithers or plucked lyres. In each area the instrument has developed somewhat differently containing a variety of forms, and thus also the Finnish kantele has personal features that distinguish it from other related psalteries. Nowadays kantele seems to celebrate its new golden age in Finland: diverse historical layers with different playing techniques live side by side with the modern versions of the instrument. There are amazing amount of different possibilities and versions among the family of kantele instruments, including 5 to 15-string kanteles, various other traditional models with 19 to 36 strings, concert kanteles with 39 to 40 strings and electric kanteles, for example. And only imagination gives borders to the utilization of the kantele among various genres of music from folk and jazz to classical and metal music. One of the most important factors affecting the quality of the music is the instrument itself. 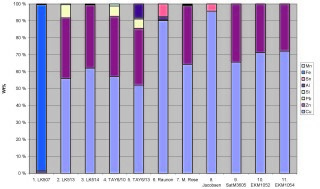 The timbre and the sound properties searched for in modern types of kantele, to suit modern aesthetics of sound, differ substantially from those of old models. To be able to come closer to the inner core of the old music, and to be able to understand its aesthetics deeper, the musician needs to have the right kind of an instrument. Without the understanding of the properties of the instrument, understanding of the music will be incomplete. In addition to the structure, the wood and the way the instrument is made, the material of the strings is also relevant. The Finnish-Karelian small kanteles of the 19th century often had brass or bronze strings (in addition to iron or steel and mainly formerly used horse-hair), and some replicas with such string material have now been made with striking results. Examining the kanteles in the Finnish museums, it becomes clear that although some common local or structural features can be found, every instrument is still an individual which has had its own individual voice. Because it isn´t possible to play the museum instruments, and because many of them are in quite bad condition, the only possibility for the hunter of the old timbre is to commission a replica. As one result of the three year project begun in 2009 by the museum of Nurmes, a book called Kantele eläväksi (~ ‘kantele turned into a living instrument’) was published in 2011 (writers: Rauno Nieminen, Timo Väänänen, Meri-Anna Rossander and Kari Dahlblom). The kantele #1626 (introduced below) as an example, the book describes (in Finnish) how to research and measure the museum instruments, and how to make replicas. In the book KIZAVIRZI karjalaisesta kanteleperinteestä 1900-luvun alussa Rauno Nieminen describes (in Finnish) 23 Karelian kanteles from several Finnish museums with detailed measures and images. Because each replica is also an individual, it is the task of the musician to discover the special features and qualities of that particular instrument so that it can bring out its best. The top replica in the photo below was made by Rauno Nieminen in 2008 of the 5-string kantele made by a famous runo singer, Ontrei Malinen, in Vuonninen, Viena Karelia. The original kantele is at the moment in the possession of the National Board of the Antiquities and stored in Orimattila. In 1833 Elias Lönnrot traveled to Viena Karelia where he met Ontrei Malinen (1781–1856), who was in his opinion the best singer of his time. The year 1833 is also carved on the short side of the kantele. The solid piece of pinewood is hollowed out from below. The kantele is fairly big and heavy, weighing 782 g. (The replica is made of heat treated wood and so not quite as heavy). The top is fairly thin, only 3–5 mm. Though the ponsi may look small from the outside, there is a fair amount of wood left underneath. The black colour of the original kantele is achieved by smoking the replica in the smoke sauna. The bronze strings currently on the museum kantele are not original, but it is very probable that the strings were bronze or brass in the first place, so bronze strings were also fitted to the replica. I played this replica on the CD Vaskikantele 1833 (Arja Kastinen, 2008, AANIA-6). The timber is warm and rich, the vibration of the strings last long, and it is easy to feel the resonance in the body of the instrument. As common with the bronze string kanteles, this instrument is tuned about a fifth lower than modern 5-string kanteles usually are. At the moment the tonic is around A3 flat. This replica was made by Rauno Nieminen of a 14-string kantele, which was bought, probably by A. O. Väisänen, in 1916 from the village of Ägläjärvi in Korpiselkä (- this instrument is introduced in the KIZAVIRZI -book on the pages 284–287). The original instrument is stored in Orimattila by the National Board of Antiquities. The replica was completed in 1999, and it has 0,35 mm steel strings like the original one. It turned out later that the strings have been renewed in the museum, but because the model of the kantele is not so old but from the late 19th century, it is possible that the original strings were also made of iron or steel. The round end and the sides are bent from one piece of a pine board. The top and bottom plates are made of birch. The original kantele had metal tuning pegs forged by a smith. To ensure usability, the replica is provided with modern tuning pegs and pins. The structure is light and the sound is bright. It is assumed that Karelian kanteleplayers got the idea to build this kind of a new model after they had seen Kreeta Haapasalo’s performances with her Perhonjokilaakso kantele. In the Karelia area this type has been used by, for example, Trohkima Shemeikka and Jeyssei Pyy from Korpiselkä, Stepan Jänis from Suistamo, and Iivana Bogdanoff and Jehki Mujunen from Läskelä. The sound of the replica can be heard at: http://youtu.be/IMgAX2krPPs I have tuned this instrument as, for example, Iivana Shemeikka and Iivana Bognadoff tuned their kanteles: the lowest string is an octave below the tonic, the next is the fifth, and from there the scale ascends diatonically. Thus the tonic is the fifth longest string. Because of the thin string gauge, I’ve usually tuned the tonic to around F4, where the resonance seems to work best. The word “vaski” is the oldest name for metal in the Uralic languages. Originally it probably meant copper, but subsequently the word has also meant bronze and brass (in some of the Uralic languages the counterparts of the word mean iron). Bronze principally signifies a copper alloy with tin as the main additive, and brass an alloy of copper and zinc. Thus, with the word “vaskikantele” people have referred to kanteles that have copper alloy strings. In his thesis “Dissertatio de Poësi Fennica”, Henrik Gabriel Porthan wrote in 1778 about kantele: “..Finnish people have altogether three kinds of instruments in use: first so called kantele [Kandele], which has five strings that used to be made of horse-hair, but nowadays of brass, and they are plucked with fingers..” A. A. Borenius mentiones several times the kantele with vaski strings in his collecting trip notes from 1877. A. O. Väisänen wrote about kantele strings in his book “Kantele- ja jouhikkosävelmiä” (1928): “In the oldest kanteles we know, the material for the strings is vaski wire (from that comes the ‘vaskikantele’): later steel wire is utilised. Also the folkpoems’ descriptions about horse-hair or maiden-hair strings may be founded on reality.” In addition, studying the kanteles stored at Finnish museums strengthens the thought of “vaski” wire as the main string material on Finnish-Karelian hollow kanteles during the 19th century and earlier. It is known that during the 19th century Finnish kanteleplayers made strings from hare-trap’s brass tripwire. The wire was made thinner by pulling it through an iron plate with ever-smaller holes. First the wire was made more resilient by heating it in fire and then cooling in cold water. It was said that this kind of treatment makes iron and steel harder, but brass more resilient. After that the wire was greased with tallow, and the end of the wire was trimmed with a file until it fitted through the next, smaller hole, through which it then was pulled. In archaeological excavations in ancient hillfort of Paasonvuori, Sortavala, this kind of a wire-pulling plate, made of iron, was found in 1978–1980 by Svetlana Ivanovna Kočkurkina. It was made of a piece of a scythe blade, and according to Kočkurkina dates from the 12th or 13th centuries. [S. I. Kočkurkina: Muinaiskarjalan kaivaukset. Snellman-Instituutti. Arkistojulkaisu 3. Kuopio 1995.] So far, we don’t have any information about kantele strings from that period of time, but spirals made of bronze and copper wire were used to ornament women’s aprons and cloaks. Several smithys with their tools and implements, and the finds of casting moulds point to the local Karelian manufacture of metal artefacts. The results showed that one sample from the museum of North Karelia (Sample #1) was iron (+ small amounts of aluminum, copper and manganese) and two other (Samples #2 and 3) were brass (copper and zinc + small amounts of lead and silicon). The kantele with iron strings was originally from Olonets Karelia, and the two brass string kanteles were from Suistamo. The two samples from the Timo Lipitsä’s kantele (Samples #4 and 5) were also brass; the other had the same composition as the brass mentioned before, and the other contained also a small amount of aluminum. The wire that I now have in the Ontrei Malinen 5-string kantele (Sample #6) is bronze: copper and tin + small amounts of aluminum and silicon. Malcom Rose’s English brass (Sample #7) consists of copper and zinc + small amounts of silicon, iron and aluminum. The wire from Lars Jacobsen was pure bronze (Sample #8), just copper with tin. The samples from the museums of Satakunta (Sample #9, the kantele originated from Suistamo, late 19th century) and South Karelia (Samples #10 and 11, kanteles originated from the former Käkisalmi museum, late 19th century) were brass (copper + zinc). Andres Peekna PhD (Wisconsin, USA) has researched the acoustics of carved Baltic Psalteries from Estonia. [See p. 99–122 in the book The Science of String Instruments, ed. by Thomas D. Rossing, Springer, 2010.] Instead of trying to find out what the old carved Baltic Psalteries might have sounded like, he decided to use the strongest available modern copper string material in his replicas, beryllium copper wire. In his research, he has come to the conclusion that beryllium copper is the best because of its sound quality and durability. I haven’t tried the beryllium copper wire yet, but among modern wires, I have bought the cryogenically treated phosphor bronze from Brian Godden, Australia. So far that wire has been a small dissapointment; the sound quality and durablity haven’t been as good as expected. The bronze wire that I now have on my replica of Ontrei Malinen’s kantele, and with which I am very content, I haven’t been able to find in the market so far. The many ”vaski” wires that I have tried have shown quite big differences in quality. In some of them the durability has been weak, or the timbre hasn’t been as hoped. A lot of different copper string material is available nowadays, but the one matching the old or desired material may not be found anymore. In the search for timbre, one has to make clear to oneself to which extent it will be possible to restore the old sound, and which experiments just contribute the ongoing discovery in the world of timbres. How would it be possible to achieve the mode of the quiet enthusiasm (see: Research) in which the player and the instrument are resonating as one? As a result of many alternating elements the happening seems to be as nonlinear as the acoustical behavior of the kantele itself. Each small kantele (5–15 -strings) has its own special features and particularly well the spectrum of varieties can be seen in the museum kanteles and their replicas. Thus, the music is born from a meeting of two individuals – a player and an instrument – the interaction having an impact on both directions. Different individuals hear different things and pay attention to different aspects in music. Listening to music is always a subjective experience which is influenced by the space (the room acoustics), the state of mind, education, age, and cultural background, for example. To elicit the timbre one is looking for, one has to study the qualities of the instrument, and search for the pitch and the interval relationships where the whole body of the instrument and the player are resonating at their best in each moment. Modern, serial production small kanteles are generally built in a way that the tonic is meant to be tuned in about D4 (- around a semitone or a tone alterations in pitch are usually easily reached). This is often not the case with the individually built kanteles and particularly not with the museum kantele replicas. The information about the suitable or ideal pitch for each kantele can be enquired from the maker of the instrument. Fine tuning is left on the shoulders of the player. At the time when Väisänen was recording this information, Teppana Jänis didn’t have a self made, but a bought kantele in bad condition. According to Väisänen, in reality the tonic was tuned three semitones lower than it was written in the manuscript, and was thus around B3. As several other Karelian kanteleplayers of the time, Jänis didn’t tune the 7th scale degree on the high strings at all, but moved from the 6th scale tone directly to the octave of the tonic. On the low strings he tuned the 7th scale degree without the help of interval comparison, and thus, according to Väisänen, it was alternating between sharp and flat (in which case the scale turned from a major scale into a Mixolydian mode). 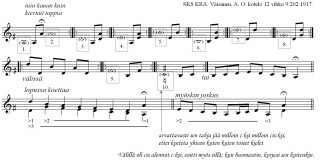 According to Väisänen’s manuscripts, at the beginning of the 20th century most of the old Karelian kanteleplayers tuned the tonic either on the fourth or on the fifth longest string, and the pitch of the tonic alternated between B3 flat and E4 flat. Usually the lowest string was either the fifth below the tonic, and from there the scale ascending diatonically, or the octave below the tonic (or the octave below the second of the scale) after which the fifth of the scale and the scale ascending diatonically again. Often the scale was a major or a mode like Mixolydian or Lydian. Some players tuned neutral third and/or neutral sixth scale degrees. Several other scales were in use, as well. In kanteles with more than 8 strings all intervals can not be tuned pure, instead the tuning is always some kind of a compromise. If, for example, on a 10-string kantele all fifths are tuned pure, the result will be a Pythagorean scale, in which the major thirds are 22 cents too wide and the minor thirds 22 cents too short compared to the just diatonic scale, and the overall sound is not pleasant. This means that some of the fifths have to be shortened – which fifths and how much, depends on the music and on the wanted scale. The fifths regarded as important ones are tuned pure, and the other, not so important fifths, are shortened as required by the music in question. 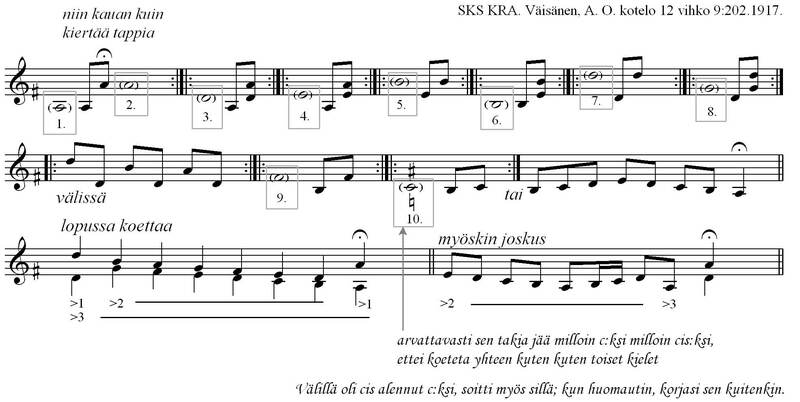 In the manuscripts by Väisänen the neutral third can be found from one player with the 10-string kantele, and the neutral third plus the neutral sixth from another player with a little bigger kantele. A typical and important character in the sound of small kanteles is the strong beating of harmonics, which is caused by the knotted termination of the string at the metal bar or the pin, and from there the direct connection to the tuning peg at the opposite side. As a result from plucking, the string starts to vibrate both in horizontal and vertical directions (in the end the vibration is more like orbicular – vibration to all directions). These two directions of vibration give two different vibrating lengths on the string: the vertical vibration has the termination at the knot, and the horizontal vibration at the contact point to the metal bar or the pin. As a result, the vibrating length of the string is alternating about 0,1–0,2 % between different directions of vibration. Thus the beating is caused by the frequency difference between these two summed up vibrating lengths. [Karjalainen, Matti – Backman, Juha – Pölkki, Jyrki 1993: Analysis, Modeling, and Real-time Sound Synthesis of the Kantele, A Traditional Finnish String Instrument. Proc. Int. Conf. on Acoustics, Audio and Signal Processing (ICAASP 1993), vol. 1 Minneapolis, USA.] As the string length grows in bigger kanteles, the relative difference between the two vibrating lengths becomes so small that it can’t result in the strong beating of sound. [Kastinen, Arja 2000: Erään 15-kielisen kanteleen akustisesta tutkimuksesta. Sibelius Academy, Folk Music Department.] The beating makes the process of tuning a little bit more difficult, but on the other hand it also has the tendency of covering the problems in the fine tuning. In small kanteles, in which the sound is produced by plucking the strings upwards, and they are not supposed to be stopped during playing, the resonance and the sympathetic vibration have an important effect on the total timber of the instrument. Thus, it is not reasonable to examine the tuning of one string at a time only. 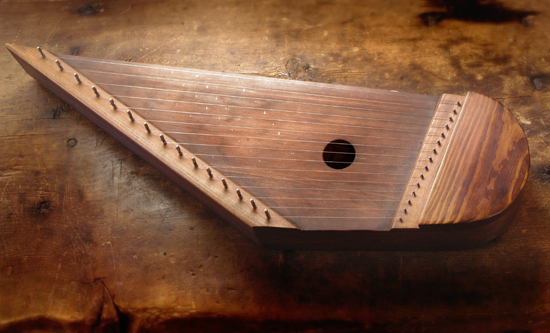 When the string of a kantele is plucked, the vibrations proceed through the tuning peg and the pin (or the metal bar) into the sound box and the enclosed air. After the complex interaction the harmonic series of the resulting sound is not the same as the harmonic series of the original string. The factors affecting the perceived sound are: the properties of the instrument – like the structure of the sound box and the way the strings are coupled with it – and the room acoustics, and also the way the player touches the string. Even the small changes in the touch will have an effect on the resulting vibration of the string and thus also on the total timber of the instrument. Because of the sympathetic vibration, the partials of the other strings with the corresponding frequencies start to vibrate along, and after a while they in turn strengthen the partials of the originally plucked string. Considering the quality of the sound, the most important part of the instrument is the top plate. Its resonance qualities and vibrational modes define to a great extent the quality of the instrument. The sound box and the enclosed air space have their meaning in inducing the so called Helmholtz resonance, though, which strengthens the lower partials of the sound. This means that kanteles with open back (no back plate) usually have the timber with stronger high partials than the kanteles with the back plate. Which timber is considered better in each situation, is again a sum of many varying components, from which the personal preferences of an individual are not the slightest ones. In addition to the previously mentioned beating in the sound, also the fact that at the very beginning of the pluck the pitch rises somewhat, brings difficulties into tuning. The rise of pitch can be heard especially well in the older models of kantele, where the tension of the strings is not as high as in modern instruments. The stronger the pluck the greater will be the rise in the pitch. Also the amplitude rises sharply in the beginning and after the transient it starts to decay gradually. Compared to the bowed instruments, for example, the sound produced by plucked instruments therefore doesn’t contain any steady state at all. Because of the resonance and the sympathetic vibration, the decay of the sound is slow in the kanteles, though. As a conclusion to all this, it is quite easy to state that there is no such thing as the one and only correct tuning for the small kanteles. There are different options, from which the player has to choose and try to find the proper one for each situation. The facts that may affect the choice can be the properties of the instrument in use, the music one is about to play, and if it is about one’s own music and improvisations, then also the mood and feelings of the player. Naturally it is easier to look for a certain timber if there is something to compare with, or the player already is experienced in different possibilities and timbres of kantele. Trained ear is able to hear the stuffy and other undesirable features in the sound. On the other hand, many of those different features can be regarded as personal matters of taste, as well. Maybe it would be the safest just to ask oneself, what am I actually looking for when tuning? For my part, I can say that I’m listening to things that react on my sensations – also physical ones, that is: I’m looking for the timber in which the whole body of the instrument is resonating in a way that I can feel it. The resulting sound is bright (which can also be dark), free and rich. Finally, especially in this genre of music, the Karelian small kantele music from the 19th century and earlier, the best way of tuning the instrument seems to be the way it has always been done, and that is to trust on the aural evaluation and the instinct of the kanteleplayer.